In the wake of the 2017 Australian legislation designed to curtail online gambling, poker operators, 888 for example, exited the country in droves. PokerStars announced its withdrawal too and is also no longer serving Australia's residents as of Sept. 11, 2017. But there's at least one organization that opted to head in the opposite direction: Ignition Casino Poker. It has been accepting new account registrations from the Land Down Under since July 2017. The only other geographic area in which Ignition operates is the United States. If you're thinking of signing up for Ignition Poker, review the information below to get a feel for what to expect. 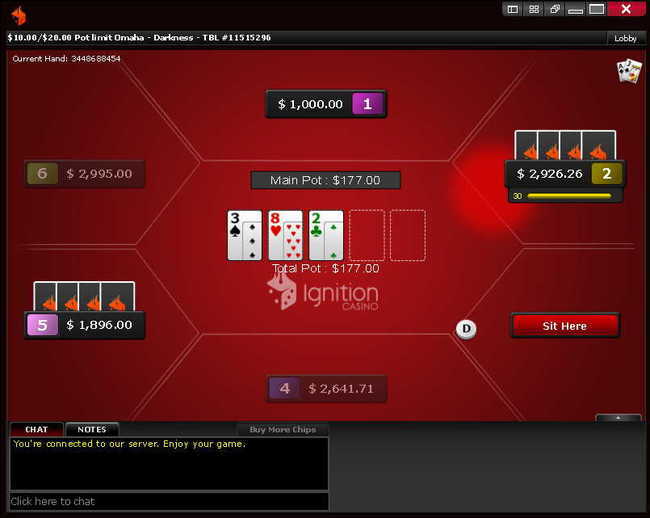 Ignition is the largest poker site in the United States and now Australia too, and its tables are known to be among the softest in the entire industry. One of the reasons for this undoubtedly lies in its focus on recreational users. All games are anonymized, and players are referred to by a non-identifying number rather than a screen name. 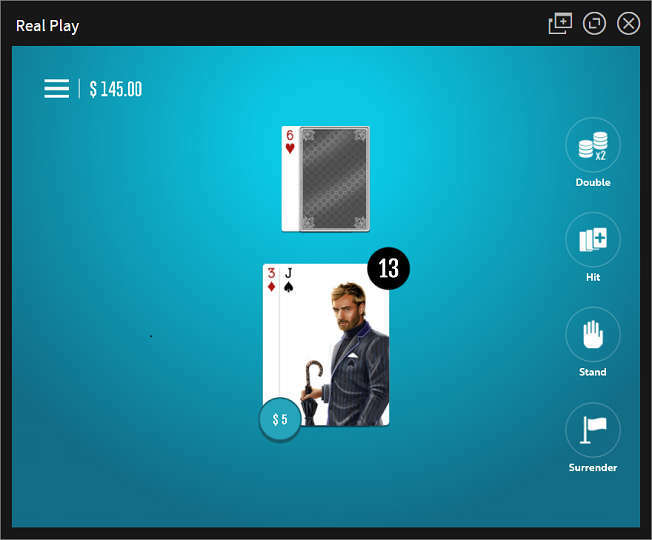 Additionally, seat selection is a thing of the past at Ignition because a Quick Seat interface, designed to emulate live poker, moves users to empty seats automatically without allowing them to choose where they want to sit. There's a table cap of four cash game tables max that anyone can have open simultaneously. All of these features make it harder for professional grinders to target their weaker opponents. That may seem like a negative, but the very positive side of it is that the games are super-soft. For those of you who were break-even grinders on 'Stars, you will dominate on Ignition. No Limit Hold'em and Pot Limit Omaha are denominated from $0.02/$0.05 up to $10/$20, and there's also some PLO/8 action. Limit Hold'em and Limit Omaha/8 are also present, at blind levels up to $30/$60. Most of the traffic is understandably concentrated in NL Hold'em and PLO, but you can get action in other games if you're willing to wait a few minutes and play different stakes simultaneously. Ignition Casino Poker is home to the Zone Poker fast-fold format, similar to PokerStars Zoom tables, which speeds up the pace of the game because anyone who folds his or her hand is instantly moved to a new table and gets new cards right away. As far as tournaments are concerned, the major weekly event is a $150 + $12 contest that runs on Sundays and guarantees $100,000 (often getting well over this amount). There are frequent tourney series that each award millions of dollars, such as the Super Millions Poker Open, which last ran in July and August 2018. Sit-n-gos are of course on the menu at Ignition, at buyins ranging from $1.05 up to $214. 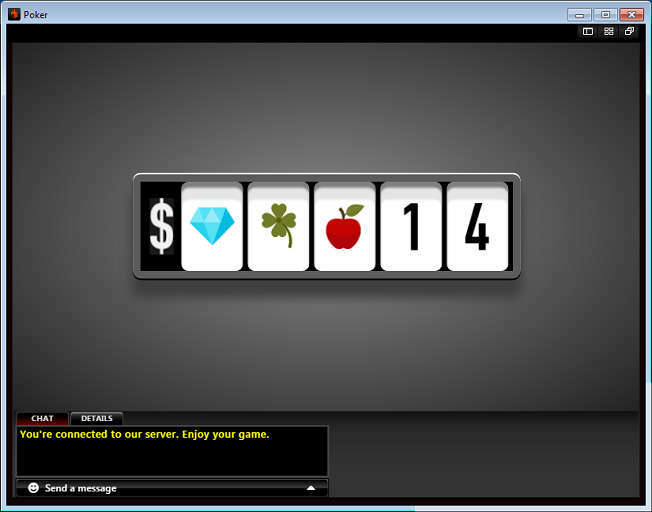 In November 2017, the popular Jackpot Sit and Go format was added to the lineup of game offerings. Aussies will be familiar with this format, called Spin and Goes on Poker Stars, as it delivers fast paced SNG action coupled with variable prize pools. Mobile poker is fully supported. 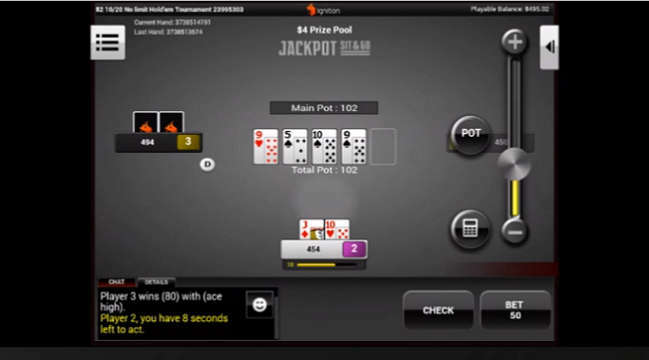 It used to be the case that only cash games could be played at Ignition Poker from smartphones and tablets, but this changed in June 2018 with the addition of sit-and-goes and tournaments to the mobile client. There's no separate download to initiate because the mobile poker room launches right in your device's browser. You can even make deposits and withdrawals through your smart device. 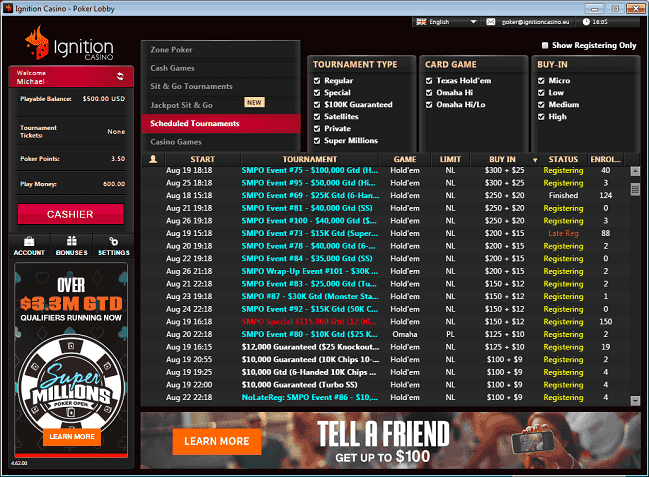 Ignition Poker operates as part of the PaiWangLuo Network, which also hosts sister sites Bovada, Bodog, and Bodog88. These firms gather together players from the United States, Canada, Mexico, China, Vietnam, and several other Latin American and Asian countries into one player pool. 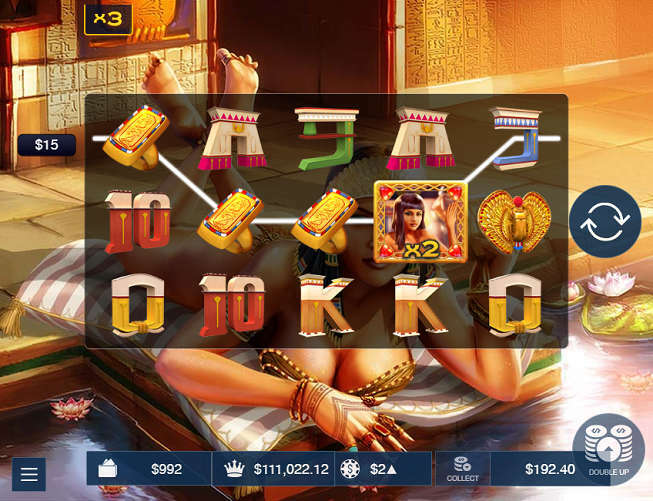 Besides poker, Ignition also provides casino gaming excitement with more than 250 titles in its lineup. Promotional offers for the poker division include an Ignition Poker bonus of 100% up to $1,350, a points-to-tickets system to reward you for your frequent play, a Bad Beat bonus, and a Royal Flush bonus. Besides the well-trafficked poker room, Ignition also has a casino with hundreds of games for you to savour. There's no Ignition Casino download package to worry about because the games launch directly in your web browser. The fully responsive site will adjust the positioning and size of the elements according to your screen size and resolution to deliver optimal performance. Blackjack is perhaps the most widely appreciated casino table game in the world, and there's no lack of 21 variants in Ignition's roster of titles. Indeed, there are nine separate types of blackjack here with subtly differing rules and optional side bets to please almost every customer. Of course, if some other table gaming choice strikes your fancy more than this tried-and-true favourite, you still have numerous options available to slake your gambling appetites. 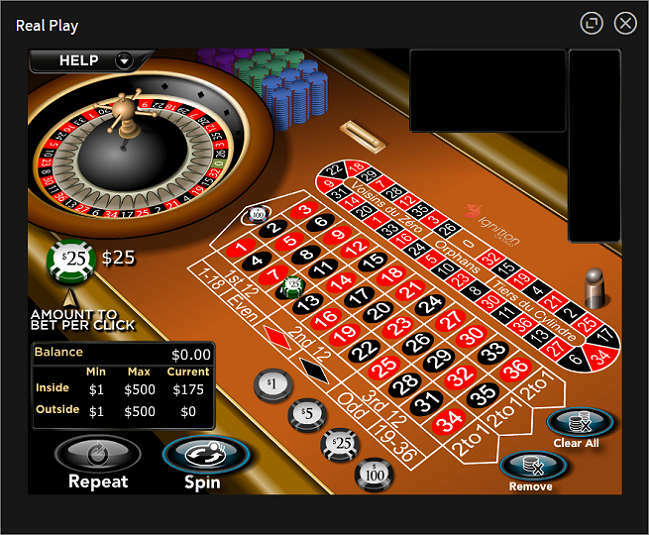 Let 'Em Ride, Craps, Tri Card Poker, both American and European Roulette, and several other types of games are waiting for you to wager on at Ignition Casino. Promos include a 100% up to $1,000 Ignition Casino bonus on first deposit, weekly $100 match bonuses, unlimited Bitcoin reloads, and the potentially lucrative Ignition Rewards program. The decision to implement a poker ban in Australia carries with it significant penalties for companies that violate it, but Ignition likely doesn't care and will probably stay the course in Australia. Ignition and its fellow PWL network member Bovada Poker have fearlessly served American poker players since 2011 without interruption, so it's safe to say that they're not disheartened by an unfavourable legal climate. The PaiWangLuo poker network is currently the eighth-largest in the world, and with the departure of PokerStars and other gaming operators from AU, Ignition is now the most sizeable internet poker destination for Australians. It will in fact grow even bigger as poker-loving Aussies flock to it and begin playing. Note that there's nothing in any proposed or active legislation that criminalizes online poker for private individuals. It's only the entities actually running the sites, like Ignition, that have anything to worry about. Whether you're an Australian searching for a new poker home or an American looking to play poker with your colleagues across the Pacific, now's a great time to open your Ignition Poker account. AUS Liberal Democratic Senator David Leyonhjelm advised his countrymen to “screw the government” and use VPNs and offshore accounts to play the game they love. However, this isn't necessary at Ignition because it serves Australian users openly and without requiring them to jump through hoops or engage in any shady shenanigans. When signing up with Professional Rakeback, you'll get access to first deposit bonuses up to $2,350. The poker bonus is worth 30% effective rakeback on your tournament and SNG fees and about 20% in ring games. Find out more about Ignition's games, payouts, and more in our Ignition Poker review. Or browse our list of recommended online poker sites for Australians. If you still have questions about playing at Ignition Poker from within Australia, look below. We're gathered some of the most frequent questions about this topic along with their answers to clarify anything that might appear cloudy. Whenever I go to the Ignition website, I see a message: “NOT AVAILABLE. Sorry, Ignition hasn't come to your region yet.” What does this mean? Ignition is open to everyone above 18 throughout Australia, so this text on the site is not valid. Still, we've encountered several Australians who see it when they try to go to the Ignition Casino homepage. In most cases, there's something wrong with these users' internet settings, and this problem is most common with those using WiFi wireless routers. The easiest solution – and one that works the majority of the time – is to reboot your router. This will clear out the cache and reset the router so that it can perform better. Most players who take this step are able to access the Ignition website without any further issues. Can I bet on sports at Ignition? Unfortunately, Ignition doesn't have a sportsbook. However, its sister site Bodog88 does, and it happily transacts with Australians. There is a drawback, which is that the poker initial deposit bonus at Bodog88 is only $500: half the size of the Ignition bonus. To learn more about this sports betting option for Aussies, check out our Bodog88 review page.